The Fabric-Lite 350W Bi-Color Kit with V-Mount Battery Plate was put together by Aladdin to provide everything you'll need to get up and running with this unique light source. The kit includes the Fabric-Lite 3 x 3' Flexible LED Mat with storage pouch, two multi-voltage AC power supplies, a dimmer with built in DMX and LumenRadio wireless DMX, and 6.6' and 16.4' extension cables. Also included is a frame to turn the Fabric-Lite into a rigid panel, as well as a diffuser, a honeycomb grid, and a soft case to carry it all in. If you've ever wished you could bend your framed LED panel into a shape that conforms to your subject matter, the Fabric-Lite 350W Flexible Bi-Color LED Light from Aladdin is your solution. The Fabric-Lite is literally flexible. Bend the 3 x 3' mat into a u-shape for wrap around lighting, into a cylinder for rim lighting, or for long, elegant highlights on glassware or other reflective objects. Its light weight, negligible heat, and thickness of only 0.25" means you can squeeze it into tight places or use it up close to the talent without fear of hazard. The Fabric-Lite is also functionally flexible. Color temperature is variable from 2900 to 6200K, and the light is dimmable from 0.5 to 100%. You can make these adjustments locally on the unit or remotely from a console via wired DMX. The fixture also has LumenRadio DMX capability for wireless freedom. The Fabric-Lite also has flexible power requirements. It is ready for worldwide use via the optional 100-240 VAC universal adapter but it will also run on optional V-mount or Gold-mount batteries when mains power is unavailable. This listing is for the LED mat only. It requires a power adapter and dimmer for use. Featuring a graphic OLED user display, the Dimmer35 for Fabric-Lite 350W from Aladdin is both wired DMX and LumenRadio wireless DMX compatible. The dimmer is able to adjust the Fabric-Lite from 0.5-100%. Two AC power supplies are required to operate the Fabric-Lite 350W with the dimmer. The AC Power Supply for FABRIC-LITE 200 from Aladdin provides 100 to 240 VAC mains current to power the FABRIC-LITE. The 6' Aladdin Universal Dimmer Cable for Bi-Flex2 and Bi-Flex4 LED lights connects the dimmer to either of these LED fixtures. The Aladdin 16' Universal Extension Cable for Bi-Flex2, Bi-Flex4, and Fabric-Lite LED Panels connects these flexible LED mats to their AC power supplies. Store your FABRIC-LITE 200W or 350W in the black Aladdin Pouch. 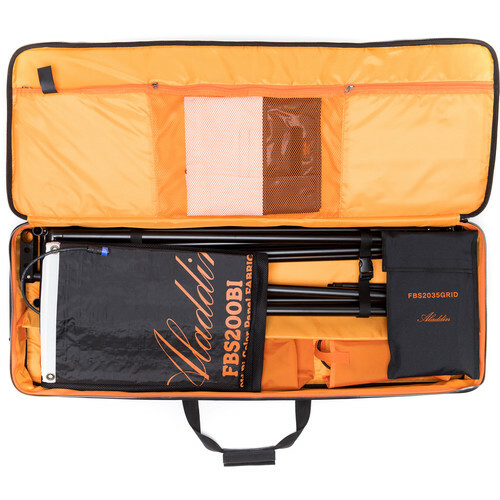 Store, protect, and transport your Aladdin Full Kit Fabric-Lite System with the Aladdin Soft Case. The Aladdin Frame for Fabric-Lite 200 is a metal support that turns the flexible Fabric-Lite into a rigid LED panel. The frame accepts such modifiers as a diffuser and a honeycomb grid. The Diffuser for Fabric-Lite 200 LED Light from Aladdin softens the bright LEDs' quality of light while it reduces contrast. Measuring approximately 3 x 3', the Grid for Fabric-Lite 200 and 350 LED Lights from Aladdin mounts quickly on the optional frame and diffuser to narrow the light's beam spread, control spill light, and provide directional control for selective lighting. Box Dimensions (LxWxH) 8.3 x 3.75 x 3.6"
Box Dimensions (LxWxH) 10.0 x 7.75 x 2.4"